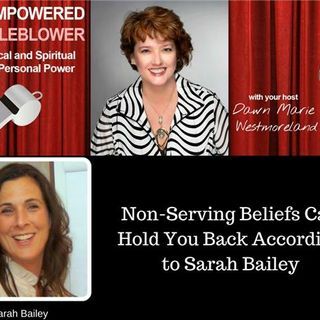 Most of Sarah Flaherty Bailey's clients have been carrying LIMITING BELIEFS that have been holding them back from the life of their dreams. On average, adults have between 50,000-70,000 thoughts per day and feel like one word here and there doesn't make a difference. But the nuances in language can create very different realities...should vs. choose can mean the difference between obligation vs. opportunity. With this in mind the old adage "sticks and stones may break my bones ... See More but words will never hurt me" has been reinforcing the belief that words are not powerful...but they are! In addition to her one-on-one coaching, she has created The Purpose Process workshop. This intense and exciting workshop helps you discover your LIMITING BELIEFS that have been holding you back and allows you to re-write them.